Donut King also has The Royal Range, a premium donut topped and filled with all your favourites. Partnering with your favourite donut treat is Donut King’s range of delicious Quake Shakes, Thick Shakes, Milk Shakes, frozen slushy style drinks and their divine barista-made Royal Bean coffee. Akash said the Royal Bean blend is great when combined with hot cinnamon donuts and makes the perfect pick me up when having a break while doing your shopping in the mall! Royal Bean blend is a cheeky medium roasted coffee and is brewed in store. Royal Bean Coffee is available with caramel, vanilla or hazelnut flavours. For something more savoury, try Donut King’s range of delicious hot dogs. These are available with your choice of sauces; cheese, onion, bacon, or the option to have one with the lot! At Donut King the donuts are decorated the hotdogs are made fresh daily. This ensures quality and delicious food for customers every time. Shop to Win at Donut King at Kin Kora for your chance to win $10,000! 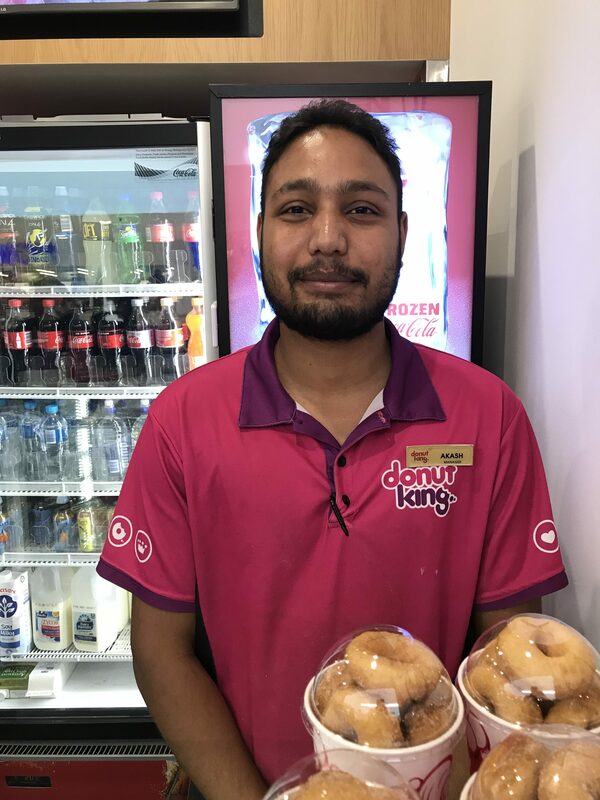 Next time you’re shopping in the mall treat yourself by calling in to see Akash and his team at Donut King!